A drip coffee maker made entirely from titanium, ideal for lightweight backpacking and camping. The Red Dot design award-winning Keith Ti3911 requires no filter paper and weighs just 100g including the mug! Amazing design and build quality, ultralight, very compact, no paper filters required. I’ve had my hands on the Keith Titanium Ti3911 for a few weeks now and I’ve used it every single day. This was useful for dialling in my brewing method, but the true test needed to happen outdoors. Why? – Because Coffee Tastes Best Outdoors! I just got back from a hammock camping weekend with a good friend. 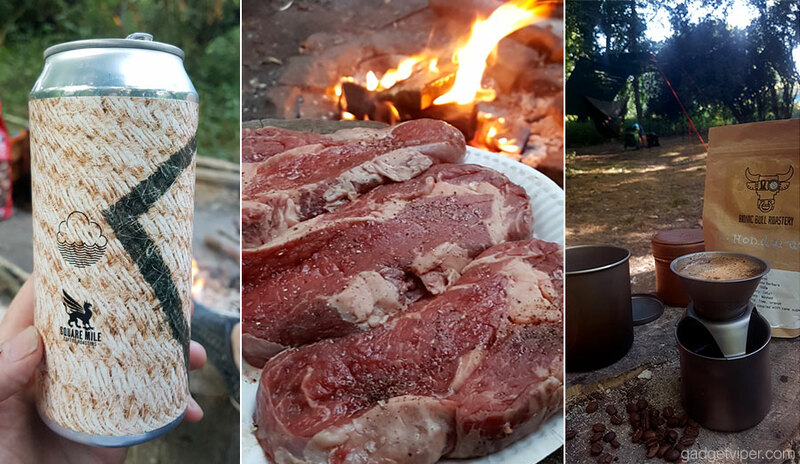 In the evening we ate amazing steaks and sipped a few choice IPA’s. We slept like babies and woke to a glorious morning and an even more glorious coffee. With the smell of the campfire still in my hair and legs riddled with mosquito bites, I now declare this product officially road tested! I discovered the Ti3911 on Amazon, the product page had a number of pictures of the components but no images or any mention of a carry case. I had assumed it would have some sort of mesh drawstring bag, which is often the case with titanium hiking gear. To my surprise, the Keith Titanium coffee maker comes inside a beautifully stitched tan leather case. As an ultralight backpacker who takes pride in shaving every single non-essential gram of weight off my kit, I’m in a bit of a dilemma here. Yes, it fits perfectly inside my cook pot and looks gorgeous, but at 75 grams, it weighs almost as much as the product itself. The vast majority of outdoor enthusiasts who are not overly obsessed with cutting kit weight will love this case. For the rest of us, I’m guessing this will join the other non-essentials kit items in a drawer somewhere. The Ti3911 is made up of four components. There’s a 200ml double walled mug, a lid, the holder that clips to the mug, and a tapered coffee filter that rests inside it. Keith has made some awesome titanium products in their time, but this one is something special. The material is ‘grade one’ pure titanium and the engineering on the filter is something to marvel at. There are a whopping 26,000 ultrafine conical holes pieced into the titanium. The holes are wider on the outside and narrower on the inside. This is said to help capture particles and aid the flow rate, as well as making the filter easier to clean. The tapered mug is a delight to hold and is designed to match a traditional Chinese teacup. I usually only use Titanium mugs while I’m outdoors hiking, but this one feels different somehow. I’ve been using it at home over the last few weeks and I’ve grown to prefer it over a regular cup. It does a great job of keeping the coffee warm, especially with the lid on the top. The 200ml (6.7oz) capacity might be a little small for those that like a huge drink, so keep that in mind. All the components fit together perfectly and the filter and its holder can be neatly stored inside the mug when not in use. For those that prefer drinking tea, the filter can be placed directly in the cup without the use of the holder. No doubt the method will vary depending on your tastes. 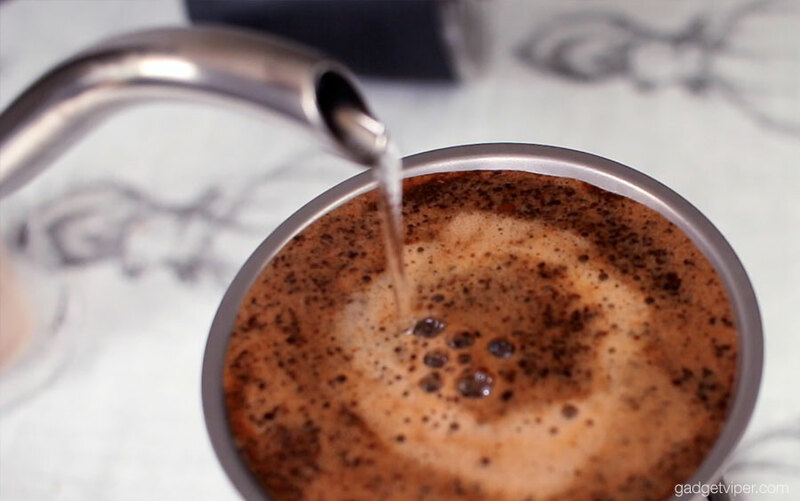 For me, I’ve found that 14g of medium ground coffee and 200ml of mineral/filter water poured over a 2.5 to 3 minutes duration works best – Here’s a link to my YouTube video demo. A set of digital scales – preferable one with a decimal place. 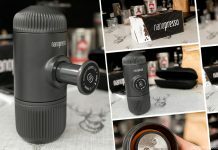 A burr grinder/ ceramic mill – I use the Hario Slim which is ideal for outdoors. A pour-over kettle – I have the Hario V60 drip kettle, but there are cheaper options. A stopwatch – You can just use an app on your phone for this. 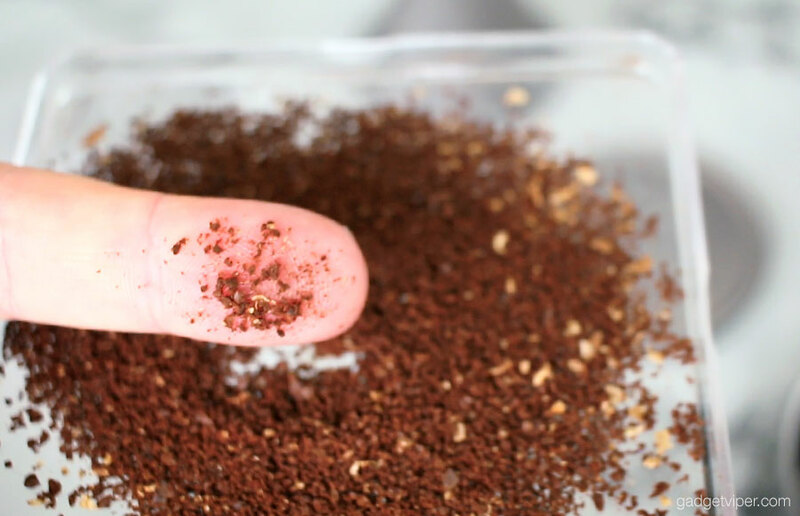 If you’re intending to use pre-ground coffee, then look for a medium filter grind. If the grind is too fine it will not flow well through the filter and you’ll end up with an over-extracted coffee. This is one reason why it’s important to grind your own beans, not to mention the vast improvement in taste. Once you have your grinds ready, it’s important to pre-warm your mug and filter by adding boiling water. This will also allow you the chance to lift and drop the filter to flush water through the holes. 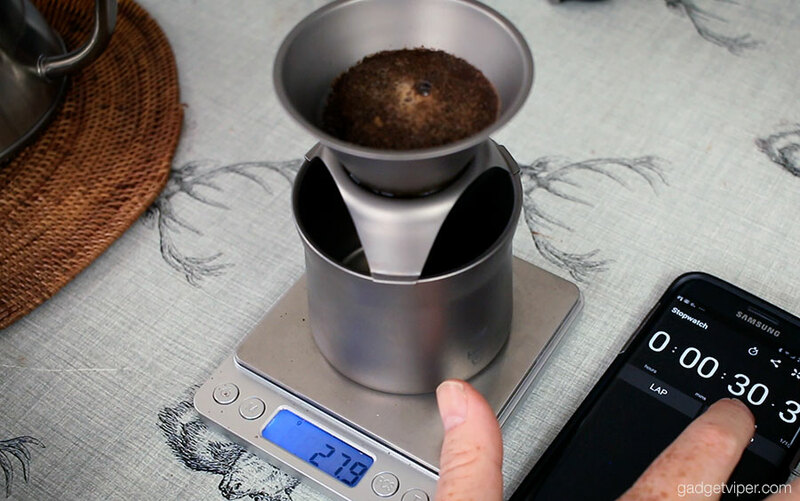 Add your freshly ground coffee to the filter, give it a little shake to level it, then place it on your scales and reset them to zero. Slowly add a small amount of water to the grinds, I use 30 grams and then let your coffee soak for around 30 seconds. You should see some bubbles appearing, this is mostly carbon dioxide escaping. After resetting the stopwatch, its time to start your pour. Using the drip kettle slowly start adding water in a clockwise direction. Avoid pouring directly on the edge of the filter or with too much force as this will disrupt the grinds. Take the water all the way to the top and then maintain the level until your scales read around 220 grams. This will give a drink of around 200 grams, the additional 20 grams will be soaked in the grinds. If the flow rate slows during the pour, you can either tap the filter with the lid or lift the filter slightly and drop it back down on the holder. If you’ve got your coffee grind right it should take no longer than 3 minutes to complete. Should it take longer, then you might want to try a slightly coarser grind on your next attempt. The Keith Ti3911 Titanium coffee maker can produce a seriously flavoursome coffee. Its pure titanium material has no effect on the flavour and there’s no paper filter to block the natural oils from passing through. The ultrafine holes do a great job of keeping the sediment to an absolute minimum. I’m sure there’s a lot of coffee lovers who favour the cleaner taste that a paper filter provides. I’ve been a huge fan of the Aeropress for years, but I’d highly recommend you try a paperless pour over like this if you get a chance. There’s definitely a difference to the flavour. I imagine many people will be deterred by the price of this product, especially when there are vastly cheaper alternatives available. Keith has a huge amount of titanium cookware and they’re all priced reasonably in comparison to similar products. Yes, this one is expensive, but I genuinely believe it’s due to the production cost and the level of engineering required. When you get your hands on this product and try it out for yourself, I’m sure you’ll agree. –The quality is remembered long after the price is forgotten. 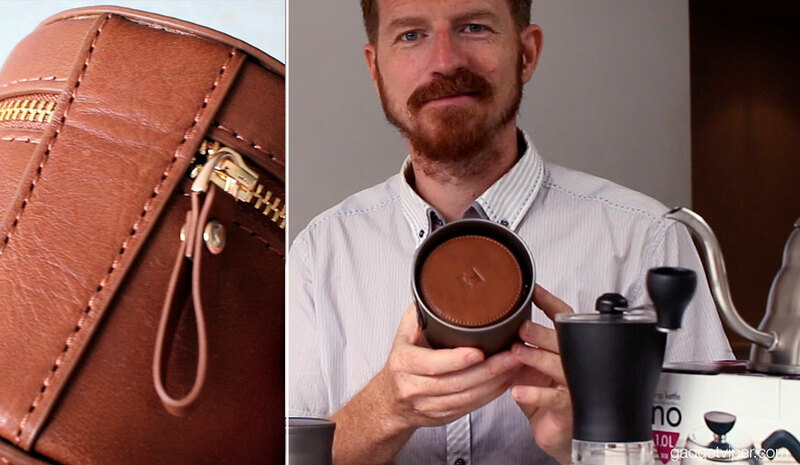 If you’re a coffee lover who’s into ultralight backpacking then this could be the next extravagant purchase guaranteed to shave some pack weight and take your coffee to the next level. The Keith Ti3911 Titanium is an ultralight pour over coffee maker ideal for lightweight backpackers. The price tag is high, but it is a fair reflection on its build quality and design. As with all drip coffee makers, you'll need to dial in your brewing method. 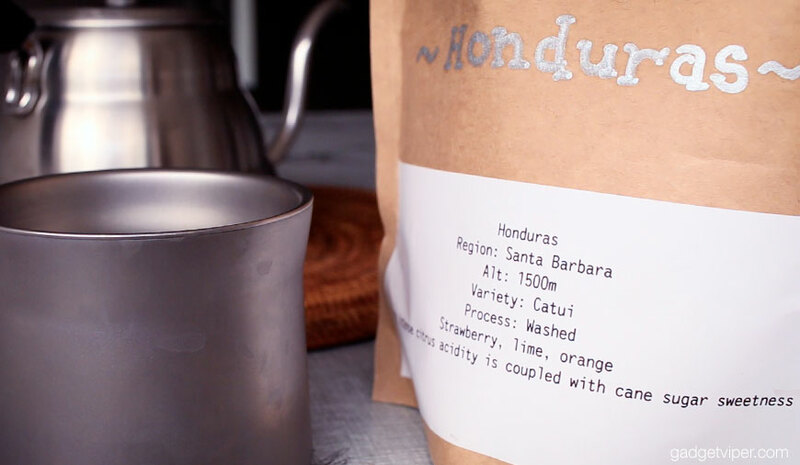 Once you have, you'll have an amazing quality, full flavour coffee. Or…You could get the Boundless Voyage version, also with a Titanium double wall cup, (or mug, if you prefer) but with a larger 350ml capacity, for just £43 on ebay! Being larger, it’s a tad heavier (153g) but that still makes it notivcably lighter than the Aeropress. Thanks for the tip, I’ll check it out, seems like a bargain! Thank you for your review! now i really wanna get this one. Simple question, what is most perfect way to rinse this one after make coffee? should i rinse it with only water or will i need to use detergent for rinse this one? i need your advice! thank you !